The Swingles are very proud to be part of the new film Downsizing! Along with composer Rolfe Kent, our own Joanna Goldsmith-Eteson and Edward Randell co-wrote a new song called ‘A Little Change in the Weather’, which you can hear us sing over the film’s closing credits. Directed by Alexander Payne and starring Matt Damon, Christoph Waltz, Hong Chau and Kristen Wiig, it’s an enchanting, hilarious movie that’s already attracted some fabulous reviews as it does the rounds of the major film festivals. 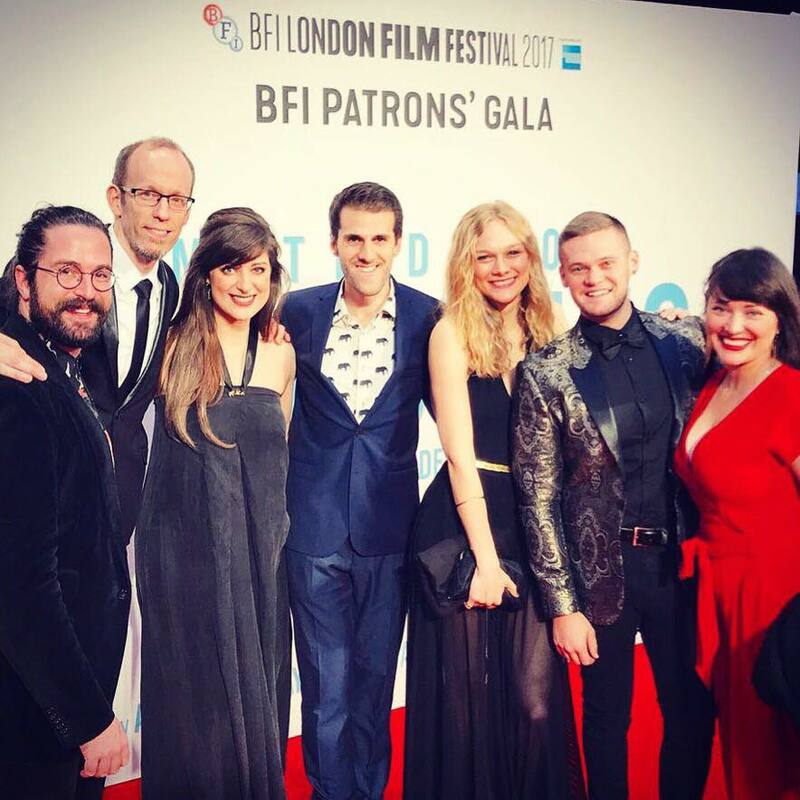 We had an amazing night at the UK premiere last Friday and even got to strut our stuff on the red carpet in London’s Leicester Square. The film hits cinemas worldwide in December: be sure to catch it, and stick around for the credits! Clare will be performing with The Swingles until the end of August before taking some time off. While she’s on maternity leave, we’re delighted to welcome back our former alto Lucy Potterton. Lucy has gone from strength to strength since leaving the group in 2011, as a solo artist (Lulah), sought-after backing vocalist (for Florence + the Machine) and session singer – we’re so happy she’s agreed to come back for a few more months of Swingledom. We’ll also be joined for several shows by the multi-talented vocalist and choir director Liz Swain (SOUND, Voicelab, London Voices), who has done a wonderful job depping for us over the last year. We’re excited and honoured to be working with these brilliant musicians! Folklore out today – Unmade LIVE video! Ladies and gentlemen, it's here! You can grab your digital copy of Folklore from iTunes right now. If you're in the UK and want to get your hands on a CD, we'll be selling the first batch at our three launch shows next week, in Manchester (29th), London (30th) and Buxton (31st). As for the rest of the world, we're working on setting up physical sales via Amazon, so watch this space. We're very proud of this album and we hope you enjoy listening to it as much as we've loved making it. We've also put up the full album credits HERE along with the stories behind the songs. To celebrate the release, here's a live video of Unmade, recorded in session at The Yard Theatre in east London. Thanks to the brilliant folks at The Hideout for their gorgeous video work, and to Hugh Walker for recording and mixing the sound. In preparation for our Folklore album coming out officially at the end of March we had to have a photoshoot. Not only would these photos end up in our album art but we had not had a shoot for about 3 years – we needed to get our new guy, Jon, in the spotlight pronto! One of the things I love about having a photoshoot is finding the right venue. Suddenly you are not just a singer any longer: you are an explorer, archaeologist, and (judging from your sometimes apocalyptic surroundings) possibly the last human on earth. Depending on the vibe of the shoot you could find yourself in a squeaky clean, sterile office building or an old abandoned public bath surrounded by dead birds, ancient cobwebs, and with paranormal echoes bouncing off the old tile walls. This photoshoot was in a church hall in Hackney that looked like it was being used for storing shop goods and odd baseball caps. We were lucky enough to be working with Nedim Nazerali again so we knew the day would be organic and full of creativity and laughs. We wanted to incorporate the idea of folk, ancestry, and heritage into a typical musician’s line-up photo, a more editorial look, and some funky and fun shots so we had our work cut out for us. I was particularly excited because the Swingles, at their own peril, allowed me to create a little costume accent for each person. My goal was to try and evoke dark dreams of past lives, of secrets and stories. It was great fun collecting all the bits and pieces to make the items with, Kevin found some great charity shop items I could rip apart and re-assemble, and Joanna just happened to have two stunning feathered collars and of course several large amulet-style pendants for us to use. That girl has got style. We decided to stick to a mostly black, gold, and iridescent green/black feather look. I kitted Kevin out with two Spanish-style epaulettes and made Oliver several medals and chains to attach to his black wool coat – think Cornish fisherman crossed with naval officer. Joanna and Clare’s look, involving those gorgeous feather collars, was reminiscent of fine court ladies with a little Moulin Rouge flair. Jon’s feathered ear piece and chain dickie were inspired by the ceremonial attire of tribes in Africa while Edward’s cravat spoke of Dickensian London. My own gold-tipped feather crown was what I’d imagine a gothic island princess might have worn. It was an absolutely freezing day, but good company and pizza go a long way to making time fly by. We cannot wait for the album to come out and we hope you enjoy the photos! When she's not singing, Sara sells her craft pieces through her Twinkling Traveller site – check it out! Folklore, released on 24 March, is now available for digital pre-order through iTunes and Amazon. Pre-order your download of Folklore – and full tracklisting! Folklore is now available to pre-order in digital form! Head over to Amazon or iTunes and hit "pre-order" to hear the album as soon as it's released on 24 March. Pre-orders really help us to make a splash online too, so reserve your copy today! And here is the full track listing for the album... we can't wait for you to hear all 12 of these beauties!